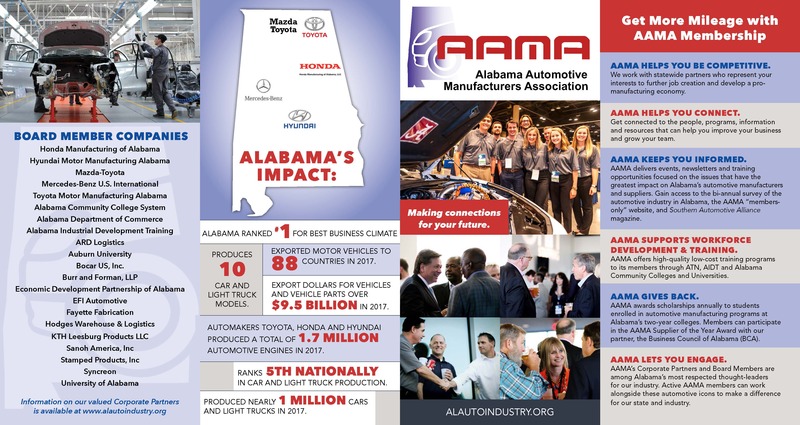 The Alabama Automotive Manufacturers Association (AAMA) was formed in 2001 to provide a forum for interaction among automotive companies in Alabama, to share information among its members and to provide an awareness of manufacturing trends, techniques and concerns. See the letter signed by all four state OEMs (Honda Manufacturing of Alabama, Hyundai Motor Manufacturing Alabama, Mercedes-Benz U.S. International and Toyota Motor Manufacturing Alabama) endorsing AAMA membership! Promote growth and continuous improvement of automotive manufacturing in Alabama. 3. Other companies and organizations with demonstrated experience in manufacturing trends, techniques or services for the automotive industry.